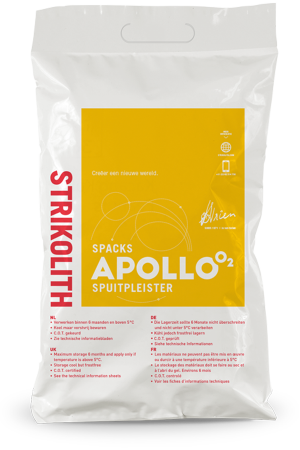 Strikolith Spray plaster Apollo O2 is applied indoors as a ready to spray quality plaster for the fast and durable finishing of ceilings and walls in the home and public utilities' buildings. Strikolith Spray plaster Apollo O2 can be applied on virtually all even and mineral surfaces. ATTENTION: Before starting work, the machine and hose must be cleaned and be made fully lime-free, before applying Strikolith Spray plaster Apollo O2. Apply Strikolith Spray plaster Apollo O2 mechanically, by means of a plaster sprayer (380/220 Volts) and a compressor, apply undiluted and uniformly. Pre-spray the first layer using plenty of air and little material (recommendation: nozzle 3 – 5). A fully covering top surface should be achieved with this base layer. With a well-prepared surface and a fully-covering base layer, it is no longer necessary to clean off the base layer. Fill in any flaws, such as casting defects or V-joints, with a brush or tar brush. The drying time for the base layer depends strongly on environmental factors. If the base layer appears matt and is hand dry, then a start can be made with applying the grain finish. The final structure required is determined by the machine setting and choice of nozzle. It is recommended when applying the structure (the grain finish) to keep the same distance everywhere from the spray gun to the surface. Clean the machine and tools thoroughly with clean water after use.